Book MS Eugenie Lake Nasser Cruise Packages For 4 Days Sailing the Nile on Board Luxury Aswan Abu Simbel Cruise. Book MS Eugenie Luxury Lake Nasser Cruise, Homey Experience Lake Nasser Cruise Ship From Aswan and Abu Simbel. Arrival in Aswan to board MS Eugenie Lake Nasser Cruise Ship. Lunch served on board. Visit to Kalabsha temple, Beit El Wali, and the kiosk of Kertassi. Afternoon tea is served in the lounge Dinner and overnight on board in the Aswan Harbour. Sailing to Wadi El Seboua and cocktail while passing the Tropic of Cancer Lunch served on board. Visit to Wadi El Seboua temple, the temple of Dakka and temple of Meharakka. Sail to Amada. Dinner and overnight aboard. Breakfast followed by morning visit to the temples of Amada and Derr as well as the tomb of Penout. Sail to Kasr Ibrim. Visit the citadel of Kasr Ibrim. (Tour is conducted from the ship’s sundeck as entrance to the site is not permitted). Sailing to Abu Simbel. Lunch served on board. Visit the Abu Simbel temples. Candlelight dinner on board and overnight. Breakfast on board and for those who wish, the possibility of a second visit to Abu Simbel (entrance ticket is not included). Disembarkation. Doctor available 24 hours around the clock. Penout Tomb is located in Amada the way between Aswan and Abu Simbel. Belived to be one of rarest ancient Egypt attractions known for the outstanding inscriptions found on the walls and columns of the temples there. 2 Egyptian temples were built here in the new kingdom: a temple for king Ramesses II which was moved to the new site several Kilometers to North West, the earlier temple of king Amenhotep III was left in its original location & is now covered by Lake Nasser. The temple of Dakka, dedicated to Thoth of the Sycamore Fig, was originally located about 100 kilometers south of the Aswan High Dam in what we refer to today as Nubia, though much of that ancient land is covered by Lake Nasser. Qasr Ibrim is an archaeological site in Lower Nubia. Kasr Ibrim was named after the ancient citadel on Lake Nasser. It is the only major archaeological site in Lower Nubia both prior to and after the Nile floods, it has remained a major site for archaeological investigations. Amada Temple in Nubia, though small, contains some important historical inscriptions and is also significant as the oldest of the Lake Nasser temples. It was built on the orders of Tuthmosis III and his son, Amenhotep II during Egypt's New Kingdom 18th Dynasty. Package price is always valid except for Easter & Christmas periods. Prices would NOT be changed once you have tour package confirmed. Children under 2 years old are free of charge in similar tour packages. Children between 5 and 5.99 years would pay 25 % of adult package price. Children between 6 and 11.99 years would pay 50 % of adult package price. 25 % down payment is required to get your tour package booking confirmed. 50 % down payment is required to confirm Easter & Xmas package bookings. Book Sai Dahabeya Lake Cruise Boat Down the Nile, Enjoy Sai Dahabeya All Inclusive Cruise For Luxury Lake Nasser Cruise Package Holidays 4 Days Abu Simbel to Aswan. Sai Dahabeya is The Greenest 5 Star Deluxe Lake Nasser Dahabeya Cruise Boat in Egypt Nile. Book Ms Kasr Ibrim Lake Nasser Cruise Ship and Enjoy 3 Night 4 Day Cruising the Nile Onboard Kasr Ibrim Nile Cruise Abu Simbel to Aswan With Tours Included, Egypt Cruise Packages To visit The Best Sightseeing Between Aswan and Abu Simbel Temple. Nubian Sea Lake Nasser Cruise Down the Nile River. Board One of Best Lake Nasser Cruises 4 Days Abu Simbel to Aswan. Book Ms Nubian Sea 5 Stars Nile Cruise Ship For Luxury Nile Cruising an Amazing Abu Simbel and Aswan Nile Cruise Package. MS Steigenberger Omar El Khayam Lake Nasser Cruise Down the Nile Onboard Luxury Nile Cruise All Inclusive. Book Ms Omar El Khayam Nile Cruise Abu Simbel to Aswan 4 Days Discovering the Secrets of The Past at Comfort and Luxury. Cruise up the Nile With MS Eugenie Lake Nasser Cruise Package, 4 Night 5 Day All Inclusive Nile River Cruise on Board MS Eugenie Abu Simbel Nile Cruise to Aswan. Wonderful Styled Lake Nasser Cruise Boat Guarantee Relaxing Homey Holiday in Egypt. Mövenpick Prince Abbas Lake Nasser Cruise. Luxury Lake Nasser Cruises All Inclusive 4 Days Aswan to Abu Simbel. MS Prince Abbas Lake Nasser Cruise Ship Offers 65 Cabins, Incorporating Junior Suites and Royal Suites Well Furnished to Make Your Stay Comfortable. Egypt Cruise Holidays All Inclusive Boat Down the Nile. Book MS Kasr Ibrim Lake Nasser Cruise Package For Luxury 5 Day Aswan to Abu Simbel. Kasr Ibrim Lake Nasser Cruise 5 Star Deluxe Aswan to Abu Simbel Named After the Historic Citadel of Kasr Ibrim on Lake Nasser. Book 5 Day Nile Cruise Aswan to Abu Simbel, Ms Nubian Sea Cruise Egypt All Inclusive is One of Best Lake Nasser Cruise Ships For Awesome Cruise on the Nile Holidays. Book Nubian Sea 5 Stars Aswan Abu Simbel Nile Cruise Ship Online Now. Cruise Down the Nile River onboard SAI Dahabeya Lake Nasser Cruise Ship. Book 5 Days Aswan to Abu Simbel By Luxury Boat SAI Dahabeya Egypt Cruise Package. SAI Dahabeya Abu Simbel to Aswan Cruise is a 5 star Dahabeya Boat sails down the Nile on Lake Nasser. Mövenpick Ms Prince Abbas Lake Nasser Cruise Package. Cruise Down the Nile On Luxury Lake Nasser Cruise 5 Days Aswan to Abu Simbel Mövenpick Ms Prince Abbas Cruise Egypt Holiday. Book Mövenpick Ms Prince Abbas and Enjoy Comfortable Stay While Sailing Down the Nile. Uncover the attractions of the past at the comfort of MS Steigenberger Omar El Khayam 5 star cruise. The Lake Nasser has lots of facilities on board; a large sundeck with pool, pool bar, Jacuzzi ,Health club, fully equipped spa and massage parlor. Book Sonesta Amirat Dahabeya Nile Cruise, 8 Days Cruise Down the Nile Aswan to Luxor by Boat. Board Sonesta Amirat Dahabeya Cruise For Luxury Dahabiya Nile Cruise All Inclusive to Explore the Attractions of Ancient Egypt. 10 Days Mövenpick SS Misr Nile Cruise Holiday Packages. 9 Nights Giza Pyramids and Movenpick SS Misr Steam Ship Cruise Luxor Aswan. Book SS Misr Steamship Luxury Nile Cruise Holiday Package to Cairo and Upper Egypt Top Attractions. Enjoy 9 Days SS Misr Nile Steamer Cruise Package. Best Steamship Nile Cruise Luxor Aswan and Cairo Stay Tour Package. Book Movenpick SS Misr Nile Cruise to Visit Giza Pyramids Then Cruise Down the Nile Onboard Movenpick SS Misr Luxury Steam Ship Cruise. Book Nour El Nil Dahabiya Nile Cruise. 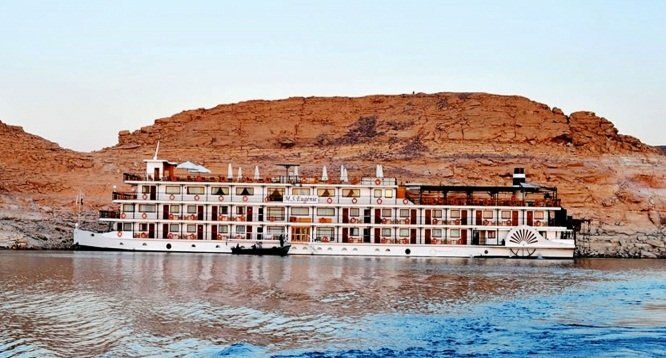 6 Days Cruise the Nile River From Esna to Aswan. Board Nour El Nil Nile Cruise, Luxury Dahabiya Cruise Egypt. Cruise Down the Nile River Onboard One of the Best Dahabiya Nile Cruises For Unique Nile Cruise Experience. Range of Best Lake Nasser Cruises. Book Aswan Abu Simbel Cruise & Nile Cruise Abu Simbel Onboard Best Lake Nasser Cruise Ships. A journey on the River Nile where you visit monuments & places only a few number of travelers who tour Egypt are able to explore. Browse Range of Best Lake Nasser Cruises, Luxury Nile Cruise Aswan to Abu Simbel by Boat and Lake Nasser Cruise and Stay Packages. Nile cruising is one the perfect options for travelers who love ancient attractions, sailing and natural wonders.